I won’t get into the details of choosing the right fly rod to get started fly fishing right now. More on that in a future article. But in order to start fly fishing you need a fly rod. There are many different brands, models, sizes, etc. that you can choose from. These can range in price significantly. I’ve seem some people spend $500+ on their first fly rod and then never pick it up again. To me that’s a shame. If you have the means, then go for it. Just don’t think that it is necessary in order to get started. A good rod to start with in my opinion is a rod that is nine (9) feet in length and either a four (4) or five (5) weight fly line. I’ll get further into the weights and lengths down the road but the basic idea is that the lighter weight rod (all the way down to 0) is typically used for smaller fish or smaller streams. With a lower weight rod, you can make a six-inch trout feel like a twenty-incher! By starting with a four or five weight nine-foot fly rod, it can be used to fish for anything from small panfish, bass, and trout. I call it an all-around weight that can accomplish just about everything you want to. Disclaimer: I’m strictly dealing with freshwater. If you’re looking to get started in saltwater fly fishing, contact me and I can direct you to some great resources. You’ll also notice a few options in regards to sections of the rod. These days you will find 2, 3, 4, and 5-piece rods common. The more sections, or pieces of the rod, the smaller it will be able to pack down to. So if you’re a backpacker, you may be interested in the 4 or 5 piece models. In years past the more sections could potentially impact the way the rod cast, but with the improvements in fly rod construction today that is nothing to worry about. A few decent starter options can be found below, or visit your local fly shop or sporting goods retailer. 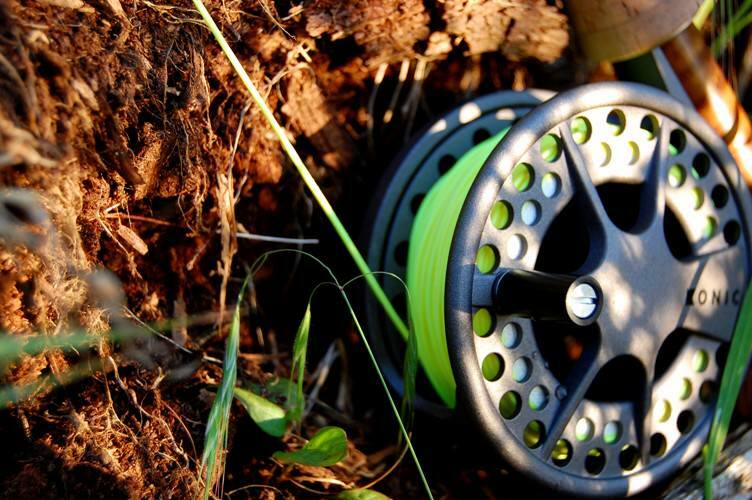 The fly reel is the next item you’ll need to get started fly fishing. Again you can find these ranging anywhere from $20 all the way over $1,000. Since I am dealing with freshwater fishing, the fly reel isn’t going to be of utmost importance and primarily used just as a holder for the fly line. If you are fishing for larger species of fish, then the fly reel becomes more important. The basics you’ll need in the fly reel is one that will match the weight of the rod you purchase. By doing this, it will allow for enough room for backing and the fly line itself. 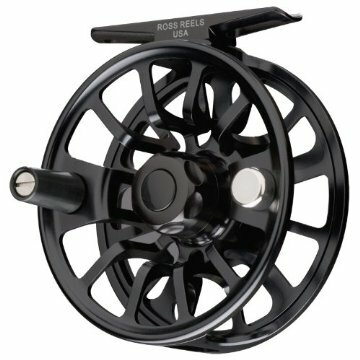 With fly reels I have used great entry level models from Ross Reels and Cabela’s. I’ve included some links to others that will work for your needs. 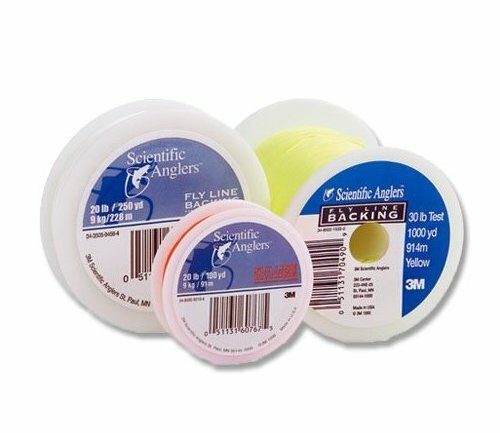 To go along with the fly reel, and probably one of the most essential pieces to get started fly fishing is the fly line. There are many different types from floating, sinking, sink-tip, etc. In the future these will be explained more in-depth. A basic line I would recommend to get started is the Weight Forward line. This tends to be the easiest to learn to cast on as the bulk of the line weight is built into the front part of the line. Another type of line is the Double Taper. You could use this to start out as well, and might not notice a huge difference, but I find double taper lines to be more specialized in what they can do. The weight of the line corresponds with the weight of the rod and reel. 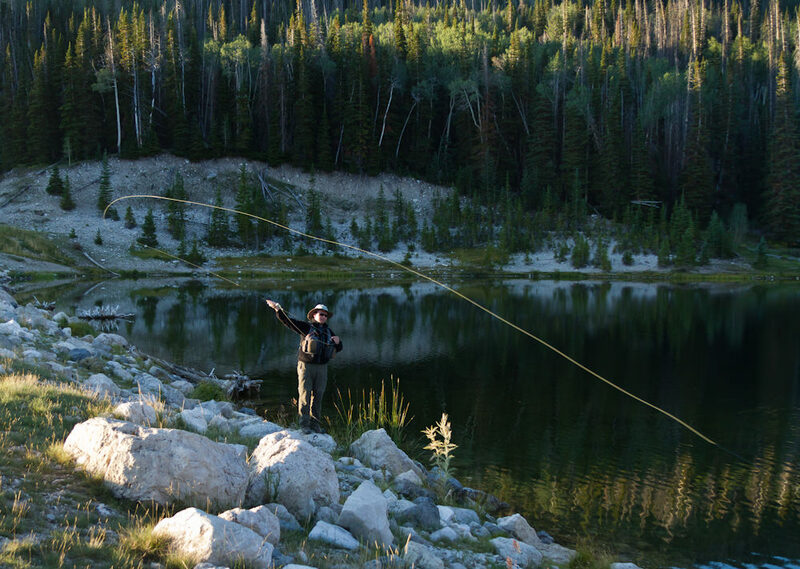 If you purchase a five-weight fly rod, you’ll need a five-weight fly line. Some of the best lines I’ve used are made by the companies Scientific Anglers and Rio. However, you can find some lower priced options that will work as well. Some of these options are listed below. The leader and tippet is what connects from the end of the fly line to your fly. 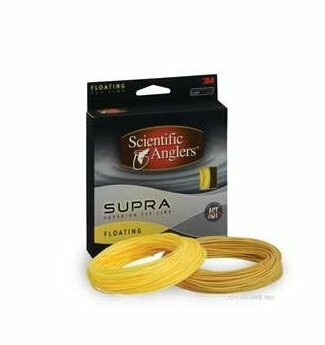 The necessity for the two parts is to enable you to cast and have your line straighten out by transferring the energy through the fly line and down to the fly. The leader and tippet are tapered to allow this process. If you have fished with traditional methods previously, you’ll probably be familiar with a pound test rating of line. This also applies to leader and tippet, but also with the introduction of an X system. I’ll get further into that later on. 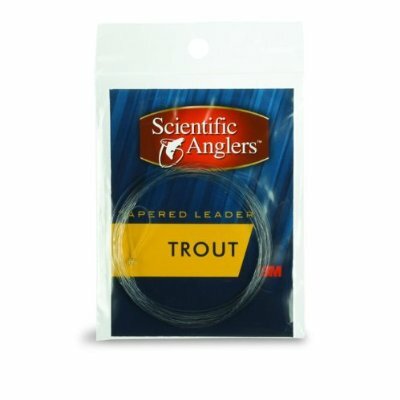 To get started fly fishing right off the bat, I highly recommend picking up some tapered leaders that are premade and ready to go right out of the package. These will combine the leader and the tippet into one with the proper taper to allow your casts to straighten out. If you’re starting out fishing for trout species, I would recommend picking up a 7.5 to 9-foot tapered leader that ends in a 5X tippet (stay tuned for more in-depth information about just what that 5X is and how to choose different types down the road). If you swing by your local fly shop or sporting goods retailer, they’ll be more than happy to help you find what you’re looking for. Some good options online include brands by Scientific Anglers, Rio, and Frog Hair. Some can be found below. 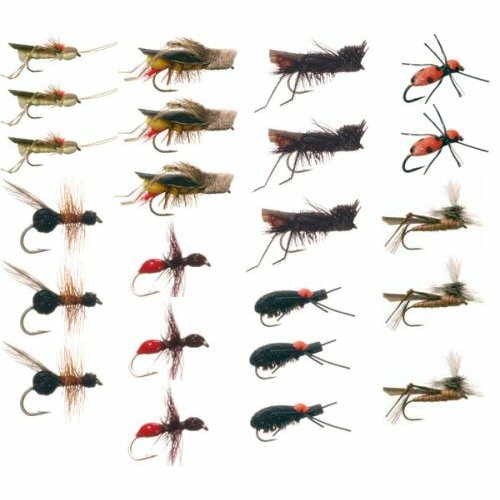 A good assortment of basic fly patterns is essential for you to get started fly fishing. You can purchase packages that will include a range of dry flies, nymphs, and streamers to get you started. More information will be coming to elaborate on the flies that are great to help you catch your 1st or 50th fish. Some packages to start can be found here. Those pieces of equipment will get you started and on your way to learning how to fly fish and catching your first fish on a fly. In looking for these items, you can also find some decent kit options that come complete with everything you would need. The only other option I could recommend to get you going is a good beginners book to learn how to fly fish. A great option is The Orvis Fly-Fishing Guide, Completely Revised and Updated with Over 400 New Color Photos and Illustrations. You can also check out your local bookstore or fly shop for information. Stay tuned though for more information to help you get started learning the fly fishing basics and be sure to sign up for my future newsletter and follow me on Twitter, Google+ and Facebook. Tight lines!